The Catholic church finally got around to apologizing to Galileo for condemning his then blasphemous support of Copernicus’ idea of a heliocentric system. You’d think that the modern British government would cut Alan Turing a little slack. Who is Alan Turing, you might be asking? Well, Mr. Turing was a genius of the Newtonian caliber who lived in the last century (1912-1954). He was a mathematician, cryptanalyst, and computer scientist. He was an extraordinary man. He was also gay. Without Mr. Turing’s accomplishments, you might not be sitting in front of a computer right now reading this. You might not be living in the country you’re living in. You might be speaking German. You could very well not be here at all. Who knows how different things would be right now if Turing had not been the man he was back then? During WWII, Alan Turing worked as a codebreaker for the Brits in the now famous Bletchley Park facility. He helped to break the Nazi codes and cyphers during the war. Thanks to Turing, the allies were able to “read their mail”; the Germans’ mail, that is. We used this information to ultimately defeat Hitler and Nazi Germany. Yet, Alan Turing was convicted of being a homosexual and actually castrated. The world was very different then, friends. The British government recently had the opportunity to pardon Mr. Turing. They failed. Their excuses are lame; based on silly legal technicalities. This man literally SAVED THEIR ASSES, yet they cannot see their way clear to forgive him his one sin. A sin which is only a sin as dictated by some silly religion. How sad for us all. Why can we not judge people by their accomplishments, their compassion, their moral goodness? Why must we continue to judge people by their skin color, their belief system, or their sexual orientation? As long as we continue to place people in pre-made pigeon holes, there will always be strife between us. The world full of “us and them” will eventually lead to a world of ashes and dust. You Brits need to get your government to take the high ground on this topic and forgive Alan Turing his trespasses. The man’s been dead for 50+ years; he won’t really care one way or the other. However, how we the living choose to act on this will make a difference to us. 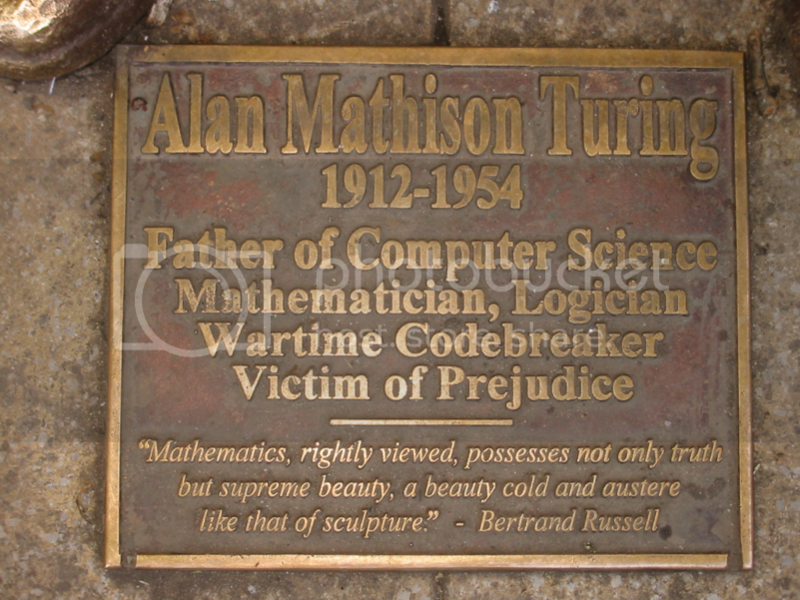 Image credits: Turing plaque courtesy of Wikimedia Commons, a worthy Internet site. Help if you can. Posted by V. T. Eric Layton on 7 February 2012 in History and tagged Alan Turing, Blechley Park, British, castration, codebreaking, computers, cryptanalyst, government pardon, history, Hitler, homosexual, Nazi Germany, persecution, WWII. Thankfully, we have become more civilised in these matters than we used to be. But let us not forget the criminalisation and the oppression of gay people that continue still in various parts of the world. There are countries in the world, even now, where being gay is a capital offence. Alan Turing was definitely a great man. What a tragic thing to happen to him after all he did for his country and the allies. There is something seriously wrong with all of this. Whatever happened to Live and Let Live? Or is that just a 007 movie now?